I was finally able to visit “Design, where are you?” at the Cité des sciences et de l’industrie. An exhibition for both professionals and the general public, for users which we all are. It’s an exhibition which questions design and looks beyond the “outer skin” of projects to better understand what design can achieve in companies, communities, in our daily lives. 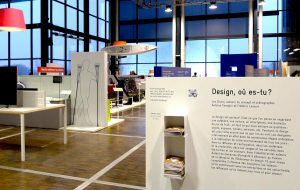 “Design, where are you?” is presented by the APCI: Agency for the Promotion of Industrial Creation. It helps businesses define an innovation strategy, advises public bodies, promotes French innovation and design internationally, highlights and supports design professionals. I will spare you the academic bla-blah-blah, which the exhibition’s literature contains a lot of. Nor will I mention all of the projects, for the complete list you should visit the Cité des sciences et de l’industrie website. What I will mention are my 4 favorite projects: MyTripSet, the Horologe Énergétique Enterprise, The Osmose Bus Station , and the new Girouette Parisian typeface for the city’s bus system. I enjoyed the exhibition, I found the majority of the projects very interesting and learnt a lot about the design industry here in Paris, and in France in general. What I didn’t enjoy was the exhibition signage, the project’s descriptions were too long, you are forced to read too much about the philosophy and theory before getting to the basic information: what and how. I have nothing against hypothesis and ideology but give me the basic stuff first, I’ll happily read the rest if I’m truly interested. Also, the exhibition’s layout is not clear, I was not sure if I was still in “Design, where are you?” or if I had walked into the adjacent exhibition. Then again, perhaps this is the museum’s strategy? Following are descriptions of my 4 favorite projects (edited from the exhibition’s website). Winner of a European award, MyTripSet lets you organize your journey throughout Europe. This travel aid establishes your circuit a la carte on a touch tablet, computer or smartphone. Flights, trains, hotels, museumsâ€¦ MyTripSet breaks down borders. The interaction design and digital architecture bring meaning to the jungle of existing networks. By focusing on the needs of travelers, they have come up with an intuitive interface and intelligent services which make a complex information network accessible. The Attoma agency, which has expertise in service design and the UX, developed the functionality and interface of MyTripSet from a base of common needs and behaviors of 4 major traveller families. Comparing transport modes, choosing your journey according to duration, its cost or carbon footprint, buying your tickets, MyTripSet takes care of everything. Raising awareness. How can employees be made aware of the need for energy savings? 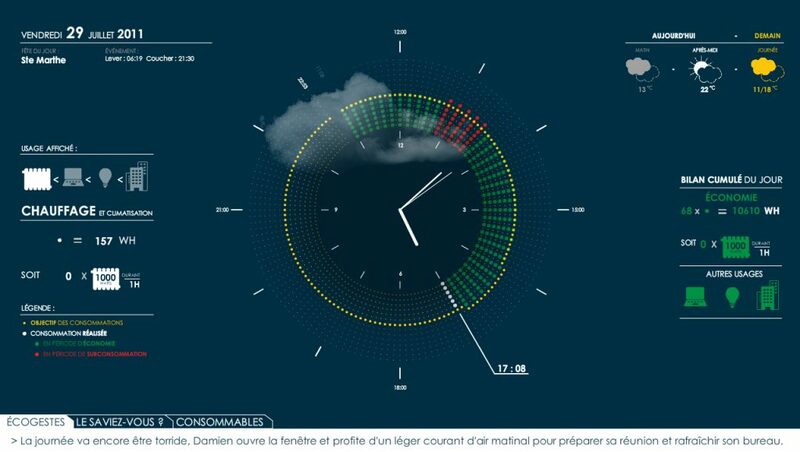 As a pioneer in the matter, EDF (Electricity of France) is making information clearer thanks to the Horologe Énergétique. Attractive and easy to understand, it shows consumption and savings caused by daily actions such as turning off your PC during lunch. Real time. Installed in regularly frequented zones, the clock offers an accessible display of the time, date, block calendar and internal communications, but also the building’s real time energy consumption. 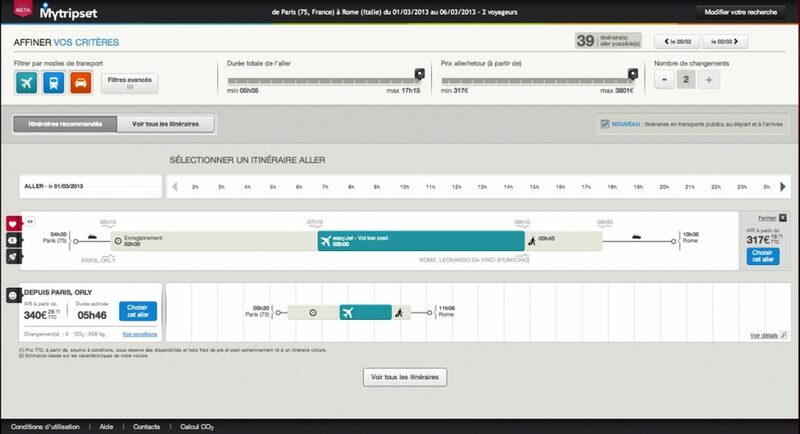 Daily and weekly evaluations and consumption targets can be easily interpreted thanks to the interface’s intuitive design. Corporate social responsibility. Driven by in-house design, the EDF team worked with In-flexions, an agency specialized in digital design. At the intersection of a range of expertise (instrumentation and measurements, economics, sociology and behavioral sciences, information system, web, marketing), the design brought employees together around a societal challenge. Waiting for the bus of the future. 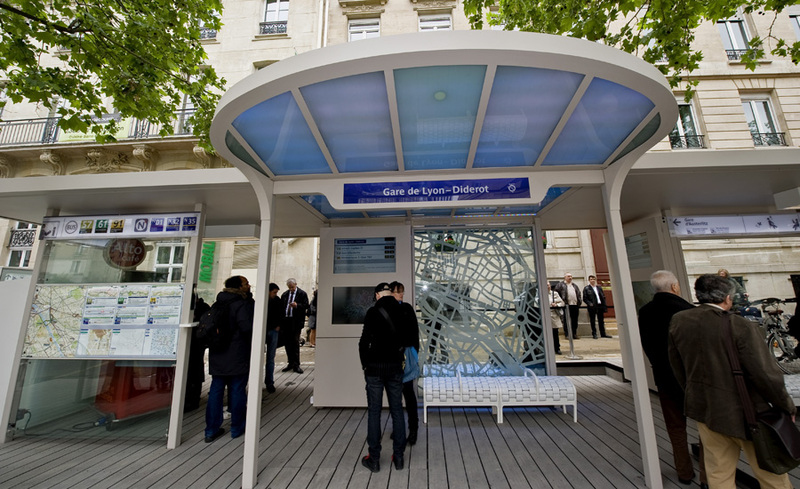 The RATP (Public Transport Authority of Paris) called on the Marc Aurel agency to come up with a new generation station. An interface between the city and the street, the bus station can also serve as a community space. The proof comes with Osmose, an experimental station at the Gare de Lyon in Paris. The designer focused on well being, in keeping with his humanist principles, choosing to create a blend of technologies and services with a touch of poetry. Vast and extensively covered with its heated walls and ceramic seats, the Osmose station is high on the comfort factor. With wi-fi and touch screens it also serves as an online facility. A coffee kiosk, library, electric bikes, everything is user-oriented. A luminous atmosphere with musical walls, Guimard aesthetics, it is remarkably harmonious. 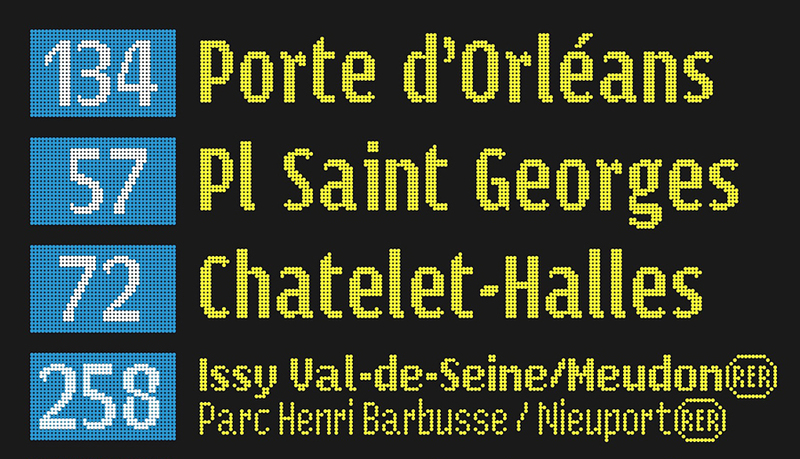 Creation of three Parisian typefaces for LED electronic bus display screens owned by the RATP. Since 2009, the 350 buses brought into service by the RATP every year have been equipped with LED signage indicating the number of the bus and the destination. Yet the Parisian typeface adopted by the RATP dates back to 1992; it was therefore time to upgrade the typefaces for information display on buses so as to offer users clearer indication of the service. The typographer Jean-François Porchez, who originally created the Parisian, developed variants on his typography more suited to the shorter format of LED panels. He also had to factor in constraints related to urban use and outline characters legible by all passengers including the sight impaired.